My contribution to WP’s Weekly Photo Challenge “…find beauty in a blur”. 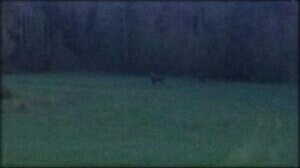 Well, it’s difficult to see the beauty in this pic – but they are standing there, in the dusk. Two blury moose. Old picture I know, but I seldom see them. My blogging friend and former neighbour, managed to catch one (with her camera) the other day. I’m impressed! A-mamman can provide you with a more decent moose pic! 😀 The classic elk photo!